Exotic shiitake mushrooms have been part of the diet in China, Japan and Korea for thousands of years! Their medicinal and health benefits are proven, from boosting the immune system to fighting cancer. This superfood became the Asian symbol for longevity since early times. Even though vitamin D comes best from the sun, we can get it from shiitake mushrooms too. They produce vitamin D2 and also produce vitamin D3 and vitamin D4. This only happens when the mushrooms have been grown in the sunlight. There is research with rats and mice that say the mushroom fights obesity and supports cardiovascular health but that type of research does not have value for me. Gingivitis is inflammation of the gums usually caused by an excess of bacteria. A study at the UCL Eastman Dental Institute in London shows that shiitake mushroom extract lowered gingivitis bacteria effectively. 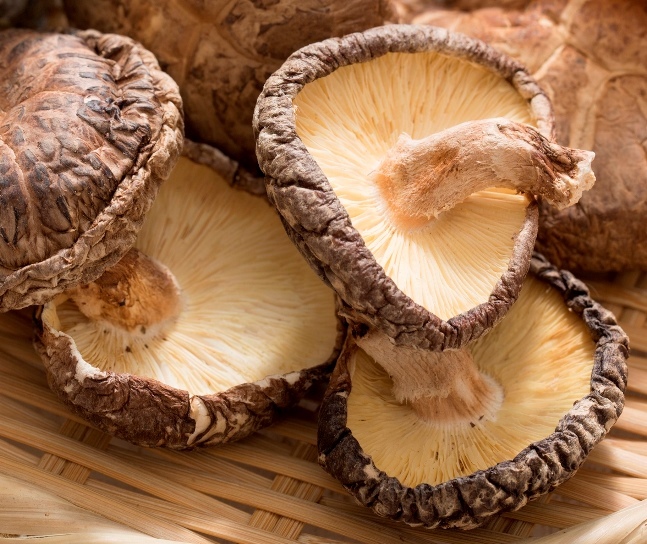 There is a study, showing that shiitake mushrooms help stop the growth in tumor cancer cells. The immune system’s function improved in a four-week study with 52 healthy males and females (aged 21–41 years). The participants consumed either five or 10 grams of shiitake mushrooms per day. These mushrooms are a very good source of B vitamins which help turn nutrients in food into energy. Also, the B vitamins help the brain maintain focus. Research has found that when there are more B vitamins in the diet then one’s energy is boosted and a foggy brain is less. Some people can be allergic to the fruit bodies or spores in the shiitake mushroom. They have purines which get broken down into uric acid. When a diet is rich in purines it may raise uric acid levels in the body, which can lead to gout. If you have symptoms of gout limit your purine intake. They are abundant in unique nutrients such as beta-glucans like lentinan, terpenoid-related nutrients like copalic acid, and amino acid derivatives like ergothioneine. Many of these nutrients have been found to be helpful in the health benefits noted above. They are rich in copper, manganese, vitamin D and dietary fiber. 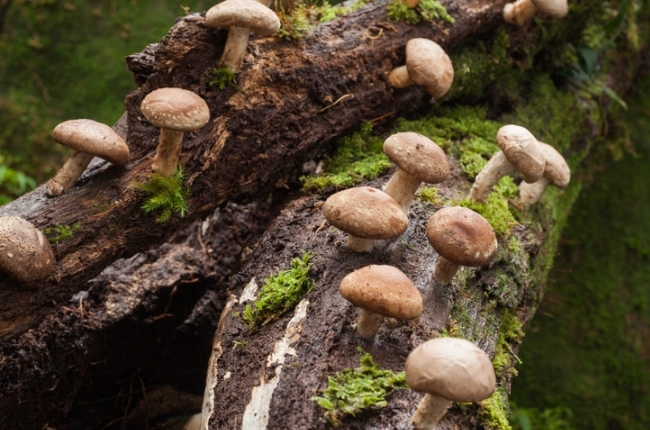 Learn more about Shiitake Mushroom nutrients. They are the most popular gourmet mushroom in the word and the second most grown mushroom next to the white button mushroom. These mushrooms were originally grown in Japan on oak logs. They still grow wild in mountainous areas of Asia, but nowhere else. China is the largest producer of these mushrooms. They have been growing wild in the mountains of China, Japan, Indonesia, and Taiwan for over one hundred million years ago. The growing of these mushroom began in 1100 AD in China, although they may have been grown before this time. They also have a long history of medicinal use in these same countries. The dried Shiitake mushroom has a more intense flavour which can make them preferable to fresh. Shiitake mushrooms were once only found dried but can now be found fresh in grocery stores. They should be plump, firm and clean not wrinkled or have wet slimy spots. Remove them from the plastic covered container and put them in a paper bag in the refrigerator for about one week. The dried mushrooms are best stored in a tightly sealed container in the refrigerator or freezer and will stay fresh for six months to one year. As they are porous, if the mushrooms are exposed to too much water they will become soggy. Lightly rinse them quickly with a little water or wipe them with a damp cloth or kitchen towel. The best way to cook mushrooms is to sauté them to bring out their unique flavour. 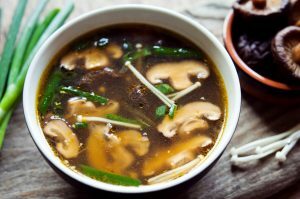 Quick Sautéed Shiitake Mushrooms with Fresh Herbs – These sautéed shiitake mushrooms are a great addition to a meal, adding the healing benefits of these special mushrooms. They are a tasty topper for rice, millet or quinoa and only take about 15 minutes to make. Shiitake Mushroom Salad with Walnuts is Very Tasty – This shiitake mushroom salad is extra delicious with the addition of walnuts. Yum! All the ingredients in this salad are healthy and so it is very good for you. A salad a day is always a good idea as it is a great way to get more vegetables into our diet. Delicious Wild Rice Risotto with Corn and Mushrooms – This is a delicious wild rice risotto which is very simple to make. The addition of mushrooms and corn makes it extra yummy. Yummy Grain-Free Stuffing with Cauliflower and Mushrooms – this is delicious stuffing without all that bread. It is very healthy and the addition of the mushroom add that extra yummy flavour.